A network is connected following the IEEE 802.3 specifications. Which of the following best describes when a device can transmit messages? The device listens to determine if the transmission media is free. Ethernet 100BaseFX networks use what type of cabling? Your network follows the 100BaseTx specifications for Fast Ethernet. What is the maximum cable segment length allowed? What type of cabling is used with 100BaseTX Fast Ethernet networks? You are planning a network for an educational campus. Due to the size of the buildings and the distance between them, you have elected to use 10BaseFL hubs, cabling, and network interface cards. What is the maximum length for the network cable between a workstation and a hub? Which Gigabit Ethernet standard uses multimode fiber-optic cabling and supports network segments up to a maximum of 550 m long? You have been tasked with designing a high-speed Ethernet network. Your client’s building already has 150 ohm shielded twisted pair wiring installed. Due to budget constraints, they have asked you to reuse the existing wiring instead of installing new fiber optic cabling. Which Ethernet standard could you implement in this situation? Which of the following standards is used by SONET? You need to transfer data from one laptop to another and would like to use an Ethernet cable. You do not have a hub or a switch. Which type of cable should you use? You want to connect the LAN port on a router to the uplink port on a switch. The switch does not support auto-MDI. You have two switches that you need to connect using their uplink ports. The switches do not support auto-MDI. You need to connect a workstation to a switch using a regular port on the switch (not an uplink port). The switch does not sport auto-MDI. You have purchased a new router that you need to configure. You need to connect a workstation to the router’s console port to complete the configuration task. Which type of cable would you most likely use? Which of the following connectors is typically used on one end of a rollover cable? Using the exhibit to match the connector type on the left with the corresponding letter on the right. You want to create a rollover cable that has an RJ-45 connector on both ends. How should you connect the wires within the connectors? You are implementing a SOHO network for a local business. The ISP has already installed and connected a cable modem in the business. The business has four computers that need to communicate with each other and the internet. You examine each computer and notice only one of the four has a wireless NIC; they all have ethernet NICs. You manage the two-location network shown in the exhibit. 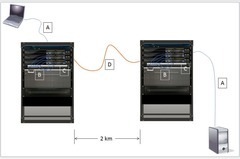 Workstations and servers at each location connect to a patch panel using behind-the-wall wiring. The patch panel…. Drag the cable type on the left to the most appropriate network location on the right. Which of the following tests can be performed by a TDR? Measure the length of a cable. Identify the location of a fault on a cable. You have a network connected using a physical bus topology. One of the cables connecting a workstation to the bus breaks. Which of the following best describes what happens to network communications? No device is able to communicate. You are creating an Ethernet network for your company. The shipping department is located in a different building that is located 150 meters from the main wiring closet. You connect a single Cat 6e cable to connect the wiring closet to the shipping building. Which of the following should you include in your plan? A user from the Sales department calls to report that he is experiencing problems connecting to the Sales file server. All users in the Sales department connect to the Sales server through a single Ethernet switch. No other users have reported problems connecting to the Sales server. Which of the following troubleshooting actions are you most likely to perform first? Replace the network card in the user’s computer. Users report that the Internet is no longer accessible. You suspect that the line connecting your building to the Internet is not working properly. Which of the following allows the service provider to remotely test the local loop? You are troubleshooting a client connectivity problem on an Ethernet network. The client system has intermittent connectivity to the network. You discover that the UTP patch cable is run 75 feet from the wall outlet, passes through the ceiling and over several florescent light fixtures before reaching the client system. Which of the following may be a cause of the connectivity problem? You are moving a client to a new location within an Ethernet network. Previous to the move, the client system did not have any difficulty accessing the network. During the relocation, you attach a patch cable from the client system to the wall jack and from the patch panel to the switch. Once connected you do not get a link light on the network card or the switch. You swap out the cable running between the patch panel and the switch with a known working one but you can still not connect. Which of the following might you suspect as the problem? Failed patch cable between the client system and the wall jack. You are creating an Ethernet network for your company. The shipping department is located in a different building that is located 150 meters from the main wiring closet. You connect a single Cat6e cable to connect the wiring closet to the shipping building. Which of the following are you most likely to experience? You have decided to implement Gigabit Ethernet on your network. Each switch port is connected to a single device. Following the installation, you find one device connected to a switch that is only running at 100 Mbps. Which of the following are likely causes? You have a cable Internet connection at home. The installer had connected the router near the outside wall of your house with RG-6 cable. You move the cable router a distance of 50 meters using RG-8 cables and special connector adapters. Which condition are you most likely to experience? Which of the following standards is typically used in a rollover cable?